Love will move us forward. We might shy away from extravagant love or be reluctant to show it...Mary's anointing of Jesus' feet is a testimony to us that love matters...showing an extravagant measure of love just might be propelling somebody forward into their future. In Jesus Christ, we are loved with a measure of extravagant love that indeed propels us in into our futures to love others as Christ has loved us. We have lots of Easter Eggs to fill for the children's egg hunt on Easter Sunday. 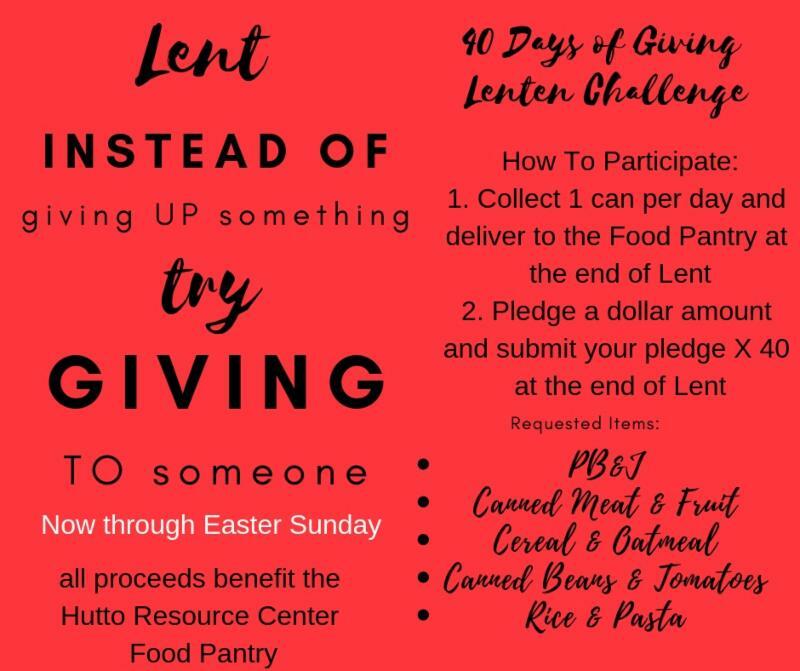 Please bring candy to fill them on Palm Sunday. If you prefer to bring after Palm Sunday, please bring filled eggs. Easter Sunday at 10 AM we will be flowering the cross. Please bring flowers to help decorate the cross as a celebration of the resurrection. A call committee has been formed to pursue the process of calling an ordained pastor after our internship term ends on August 12. The members are Jane Bolgen, Lloyd Mattingly, Claudia Cook, Jane Sweeney, Bruce Deuwer and Bobby Stern. Please remember these people and the process in your prayers . During the next several weeks you will be receiving a call from a member of the Welcoming and Assimilation Team . 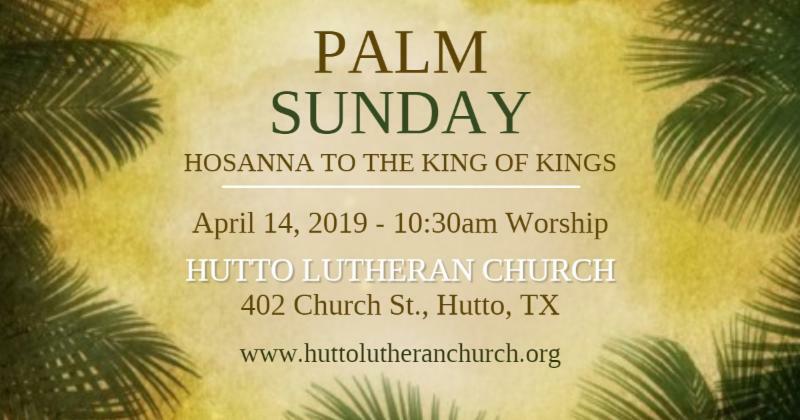 Our purpose is to reach out to all members of Hutto Lutheran Church to inquire how we can be praying for you. The person contacting you is committed to keep your concern confidential and pray for you. We look forward to speaking with you soon! April 14, this Sunday, we will discuss what study to begin next for Adult Sunday Time. The time studying 'What Is The Bible' was very rewarding. Please come Sunday and give your input on what we could study together next. Feeding the 5,000 will be providing hot dogs, chips and bottled water at the Parks and Rec event April 13 th from 10am to Noon. More info to come. Saturday, April 13 th will be our Church Property Clean Up Day from 8 til noon. General trimming and cleaning of flower beds. Please bring your favorite gardening tools and gloves. Your help in sprucing up the property for Palm Sunday and Easter is appreciated. The day was a huge success. Rain was forecast for the morning, but held off until after work was completed. Sixteen new marker stones were placed on grave sites to supplement headstones that were getting difficult to read due to deterioration. Two corner posts were set at corners of the drive thru the cemetery. Trees were trimmed and debris hauled off. The culverts at the entrances were straightened to allow water flow. Trimming was done around the grounds. Thanks to all who were able to help with this. Please contact Vicar Katie if interested. Our monthly meeting will be Tuesday April 16 th in the Fellowship Hall at 11:30. The lunch theme will be 'Welcome Spring'. Bring a dish that reminds you of spring. Pastor Travis Summerlin will present a monologue of the Roman Soldier . A free will offering will be taken for Pastor Summerlin's church, 10th Street Methodist Church, Taylor. May 14 th the OWL's will meet at Dell Diamond for Taco Tuesday to see the Express play the Oklahoma City Dodgers at 11:35 AM. May 21 st we OWL's will have lunch at church at 11:30 followed by a visit to Mike and Donna Fowler's garden . Ladies, our next Bible study will take place Wednesday April 17 th at 9:30 AM in Classroom #1 of the Fellowship Hall. All ladies and friends are encouraged to attend this study and fellowship opportunity. 10 AM Flowering the cross. Dorian & Efraim Brandt ; Bowen David ; Stacie Welch ; Lana Guckian , niece of Christina Pompa; Christine Donoghue , sister of Heather Duewer; Wayne Erickson ; Steve Robles Jr. ; Greg Almquist ; Tonya Cermeno ; Weldon Zimmerman ; Chris Harris ; Wyatt Krueger , great nephew of Jill Johnson; Bobby O'Rear , friend of Connie Seigmund; Darlene Rydell ; Tommie Barrera , mother of Catherena Rydell; Jackie McGary ; Barbara Kinneman ; Nathan Pompa , grandson of Dennis & Christina Pompa; Storm Britten-Llouno ; Doug Nelson , brother of Sharon Holman and Nancy Johnson; Shery Fincher ; Curtis Wahrmund ; Linda Wahrmund; Eddie Hayden; Heather Deuwer; Dana Collins , co-worker of Bill Sigmund; Kelly Wilkerson; Melissa Kriegel , friend of Connie Siegmund . For the month of March, the Budgeted income is $16,288 and the actual income was $28,677. For the Year to Date thru the end of March, the Budgeted income is $48,863 and the actual income was $53,503. Through the teachings and events of the passion story we see and hear the great contradictions that characterize the coming of God’s reign. The leader serves, the empty disciples are able to fill others, proud Peter is revealed in his cowardice, and Jesus—the innocent bringer of life—is arrested, beaten, executed, and buried. Lessons and Sermon from this past Sunday, April 7 th . Fifth Sunday in Lent .